On February 18th, 2016, Discovery's Board of Directors approved the move to our new home, and we could not be more excited about the everything that has happened since. In June of 2016, we officially moved in, and our school is now located at 2740 West Central Ave., just around the corner and 1.4 miles from our former location. This giant complex features a huge green area for recess, playground, community garden, baseball diamond, outdoor picnic shelter, gymnasium, library, courtyard, auditorium, two computer labs, and much more. 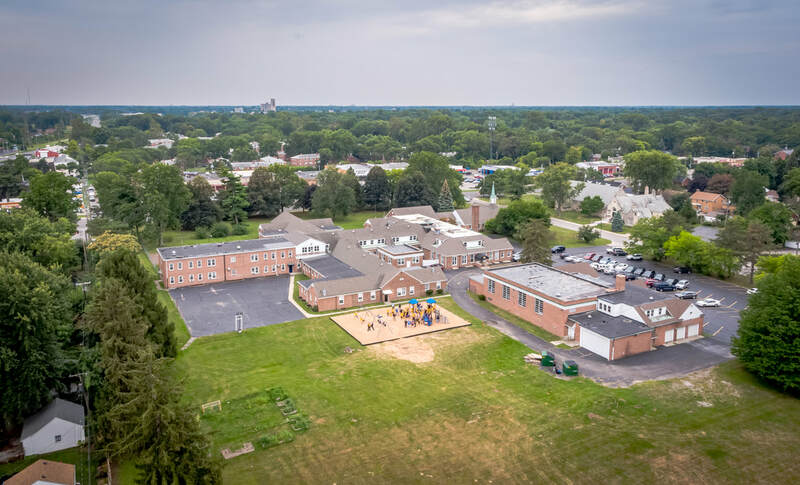 In addition, it has enough classroom space to ensure that we will be able to keep our sixth grade intact, something we would not have the option to do staying in our previous location. The most important thing for us is to ensure that the quality educational program we have built at Discovery over the years will continue as we grow in our new home, and we feel that this building gives us the best chance to continue that journey with your children. If you have any questions, please feel free to contact the school. Thank you for all your support, and welcome to our "forever home"! The ground floor will house the majority of the school, including grades K-4, the library, cafeteria, auditorium, three computer labs, and our RTI and SPED areas. The gymnasium is a separate building but the walk from the main building is only about 10 yards to get to the gym entrance. The second floor features our 5th and 6th grade classrooms, restrooms, lockers, and additional classrooms for small group instructional support. The west end of the second floor will house the Discovery Small Stars pre-school program. Below is a galley of images from the new building.